Yesterday was the 59th annual awarding of the Grammy. Surely, everyone knows that the Grammy is famous for stunning, daring and breath-taking red carpet outfits. Here are some of the evening’s most mind-blowing looks. Lady Gaga showed up in patent leather set by Alex Ulichny with Pleaser boots. No one but her would have been be able to wear this look with so much style. Unfortunately, we do not know what to make of Katy Perry’s outfit. She wore a Tom Ford dress and Lorraine Schwartz jewels. However, great names do not make great style. Laverne-Cox wore a custom Bryan Hearns dress, a Borgioni bracelet and Stuart Weitzman shoes, all of which was well-matched. She definitely knows how to highlight her curves. The artist Girl Crush certainly drew a lot of attention yesterday evening. No wonder, because everyone was trying to figure out what she was wearing. A ball pit, maybe? Wearing a Micheal Costello dress and Devi Kroel clutch, Maren-Morris was elegance personified! Love Celine Dion, but this Zuhair Murad gown is a miss. Christmas has been over since last year! 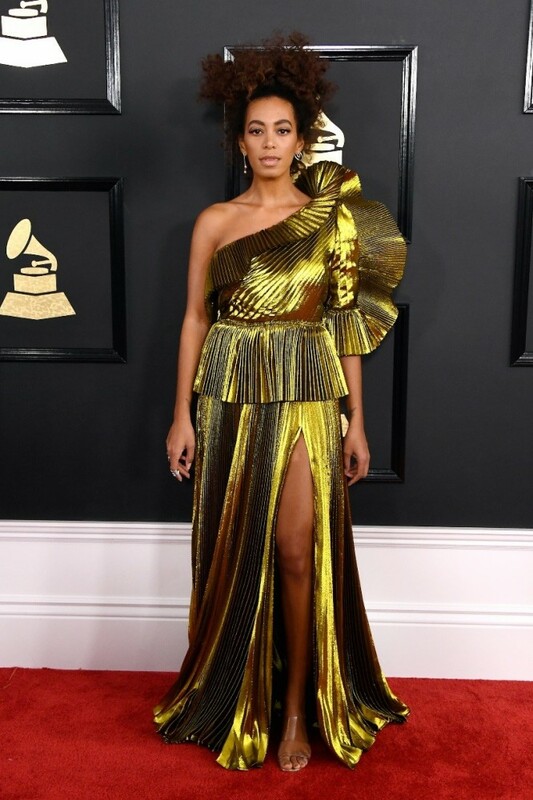 Solange Knowles looks stunning as she picks up her first Grammy in an amazing pleated, asymmetrical gold Gucci Gown. Coincidence? Taraji P Henson misses the mark with this ill fitting Marc Jacobs mini dress. A surprising faux pas for the usually stylish Empire star. Adele is glowing with hair and makeup flawless as always, but this Givenchy couture gown by Riccardo Tisci was just too busy.